This weekend sees the two winners of the Wellington Regional Condor Sevens, St Pat’s Silverstream and Wellington East Girls College, plus boys’ runners-up Scots College, all in action at the National Secondary Schools Tournament at Auckland’s Kelston Boys’ High School. Both the boy’s squads head to the event in good form and with high hopes. Silverstream won the Colts section of the WRFU open tournament in mid-October, then followed that up by beating Scots in the last play to win the regional Condors qualifying tournament on Labour Day after surviving a strong challenge from St Bernard’s in their semi-final. In turn Scots went out the next weekend and retained their Colts title at the WRFU’s Ambassadors Trophy event, dispatching a Marist St Pats/St Pats Town team in that final; and followed that up by winning the inaugural Hurricanes schools 7’s two weeks ago, exacting revenge over Silverstream in the semi-finals before beating Wellington College in the final. The Boys tournament has been expanded this year from 16 to 24 teams. Wellington was amongst the regions that benefitted from that with an additional qualifying place, while other large multi-province regions have been broken-up. 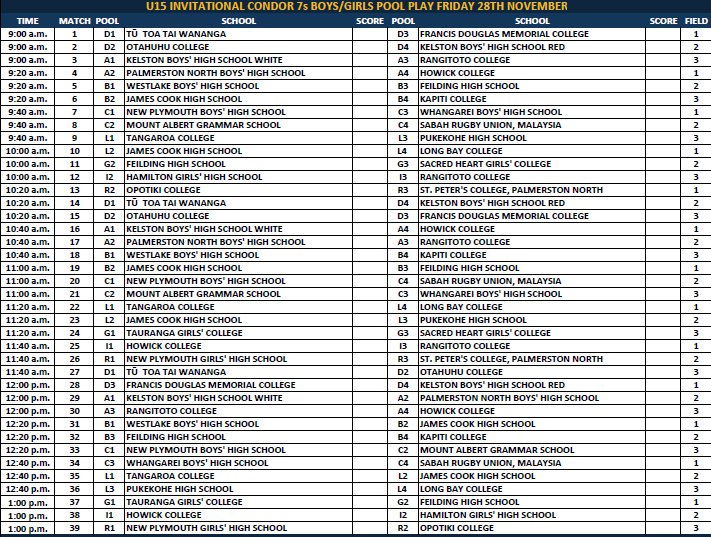 Most of the national rugby powerhouses will be at the event along with the likes of St Johns Hamilton, Wanganui Collegiate, and Opotiki College, but notable absentees will be two of this year’s Top 4 schools; Christchurch Boys High – who failed to be one of the two sides out of the wider Canterbury region – and Auckland Grammar, who didn’t even contest the Auckland event. Two sides that qualified, Thames High and Southland Boys High, will not be travelling and have been replaced by Massey High and De La Salle College. Silverstream are drawn in Pool F with Feilding High and Wesley College. They may prove an unconventional opponent, having so far preferred to use a 15s-style go-forward approach rather than the probing style more common in the shortened format; but they may change that with NZ Schools representatives Losi Filipo and Lui Luamanu both absent, along with the sizeable frame of Joe Apikatoa. Jarrod Adams and Jack McCormack return to the squad, and along with Asafo Aumua, Vern Sosefo and Lester Maulolo will look to create space for speedster Salesi Rayasi to exploit. The side will be captained by Daniel Schrivjers, who shapes as an important player both on attack and in defence and has impressed so far with a high workrate similar to his older brother and Wellington sevens representative Hayden. Scots are more of a known quantity at this level, having finished runners-up to Kelston Boys last year, and return many of the same players. They will have to overcome the unavailability of Malo Tuitama who is out with an Achilles injury, but still possess significant firepower in twins Peter and Thomas Umaga-Jensen, Alex Fidow, and Michael Findlay, with Jarimar Schuster expected to win plenty of aerial battles for kickoff ball. Both Connor Garden-Bachop and Malo Manuao have looked sharp as well, particularly at the Ambassadors Trophy where they shared the playmaker role. That role will however be filled in Auckland by TJ Va’a, who will be looking to cap both an outstanding year and college career and will captain the side. Scots are drawn with their fellow national 15s joint-titleholders Hamilton Boys High in Pool B, along with Whangarei Boys High. The strong challenges seem likely to come from the Auckland schools – Otahuhu College (who ended St Kentigern’s long 15s winning streak during the year), won their qualifier final over Mount Albert Grammar with St Kents claiming the third spot, and all will be contenders. Kelston, who qualify by right as defending champions, probably can’t be written-off easily either, and Hamilton will have a strong claim as well. And that’s before considering the merits of Super 8 schools Rotorua, Gisborne and Hasting Boys High’s, South Islanders Nelson College and Otago Boys and central North Island schools Francis Douglas and Feilding High, and even then there could a surprise package lurking amongst the rest of the teams. Both Silverstream and Scots will need to win at least one of their pool matches to qualify for the round of 16 matches on Saturday afternoon. Should they do that, then Silverstream will face a side from Pool C, while Scots’ opponent will be from Pool G. The winners of those games will go onto the Cup rounds on Sunday, with the losers heading for the Bowl section. Wellington East also know what to expect, having like Scots represented Wellington at the event last year and securing a return after seeing off Porirua and St Catherine’s in the playoff rounds at the local event. They are drawn in Pool I with Northland runners-up Ruawai College (who have replaced Kerikeri HS in the field), Canterbury winners Lincoln High, and last year’s national runners-up New Plymouth Girls in the 16-team field. Paige Misky, Mila Reuelu-Buchanan, and Marcelle Parkes were all contributors to their Labour Day success, though much of their hopes will reside with captain Jaydah Timu and Georgia Broughton, who scored a hat-trick in the regional final win and the daughter of coach and Marist St Pats stalwart Norm. Defending Condor and National 15s champions Hamilton Girls will start as warm favourites, while New Plymouth GHS, Feilding HS, Southland GHS and South Otago HS are other schools with national pedigrees, and with the increase in interest ahead of the Rio Olympics there are a host of teams from co-ed schools looking to put their claims forward, including Auckland schools Otahuhu College and Mt Albert Grammar. Finally, there will be a fourth College Sport Wellington school in action, with Kapiti College’s U15 Boys team taking part in the age-grade tournament on Friday before the main event over the weekend. They are drawn in Pool B with Westlake Boys High, James Cook HS, and Feilding HS. Feilding also have entered a team in the U15 Girls event, meaning that they will competing in all four competitions. Top two only from each pool proceed to the round of 16 matches on Saturday afternoon. Top team in each pool will play second-ranked team from another. Winners proceed to the Cup knockout on Sunday, losers to the Bowl section.